Home › Where to Meet Singles › What’s your plan for the January Dating Blitz 2017? It’s the first half of November. Hasn’t time flown by so quickly this year? Now that the election is over and we can finally get back to our lives again, what’s your dating wish for yourself for the coming year? Sure, you could meet your soulmate at a fall event or even a holiday party, however, I wouldn’t count on it. Your chances are very slim here. 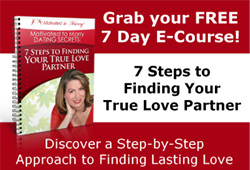 Over 75% of my successfully coupled clients have met their partners online. They implemented the Motivated to Marry Dating Secrets system and applied it to their online dating. Will you be ready for the major opportunity of the major increase (over 25%) of singles going online in January to meet your soulmate? You may have heard the story of one of my 40 something clients, Nancy. In November she had just broken up with a man she was dating for 6 months and thought he could be the one. As it turned out, her ex boyfriend could not give her the relationship she desired and be the kind of man she needed. And she had to come to terms with that and move on quickly since time was of the essence. You see, Nancy was really motivated and wanted to get married and have a family. I encouraged her to get online and we refined her profile to attract the kind of person she was looking for. On New Years Day, Jeff contacted her and they started their communication. He was also Motivated to Marry! He liked everything about her profile that expressed who she was authentically and continued to court Nancy. They feel in love, and got engaged within 3 months and married in the summertime! So what do you need to do to be ready for the January online dating blitz? 1. Consider joining another site. Look at the dating site you are on and consider joining another one. Where are the people you want to meet? I recommend you stay away from apps. They seem to attract more people who are not motivated to marry than are. 2. Update your pictures. See that your photos reflects you as you are today and your personality. Make sure your photos are doing you justice and not turning off potential great prospects. 3. Update your essays and profile information. Make sure that you are not cutting out good potential people by having too narrow range in your ages and geographic locations. Is your profile authentically representing your life goals and values? 4. Review your contact and follow up process. Review how you contact people and your follow up strategy. Have you dropped the ball? Do you leave a week or more between communication? Timing is important here. When you do connect with someone who looks promising, I recommend you show you are ready to move forward with a relationship and avoid hesitation. Most of my clients connect, recognize that the person they are dating is a great potential partner and become exclusive very quickly (within 2 weeks or less!) after they meet their person face to face. Then they can take the time to see which direction the relationship is going together. And my client can determine quickly if someone measures up because they have gone through my process and now know how to access a partner for the right stuff! Dating in January is like musical chairs. The music is playing and tons of men and women are checking each other out. Many would like to be in a new relationship by early February when the music stops! We all know Valentine’s day is February 14th! And many of those online will have found a new love prospect by then! So where will you be Tuesday, February 14th? In a new relationship sharing a romantic Valentine’s Day dinner together? Or working late at the office, just telling yourself it’s just one night out of the year again? That’s only 3 months from now! So start working on your Dating Plan for 2017 NOW! And if I can help you in any way, like I have helped hundreds to find their loving life partners and spouses then go to www.TalkwithCoachAmy.com and sign up for my complimentary Meet Your Mate Strategy sessions. I will show you how my Motivated to Marry Dating secrets system can help you find true love sooner than later. Especially since your time is very precious and you deserve to be loved by someone wonderful! PS. Go to www.TalkwithCoachAmy.com and sign up for a 30 minute Meet Your Mate Strategy Session right away so you can get on the right path to finding your true love partner. I only have a couple slots open for this month, so I hope we can talk ASAP so we can get you ready for the January online dating blitz!